Hyper little pup may be best for younger kids. Also, won’t fart like a real dog. 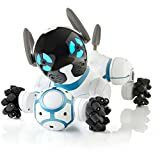 Crazy-fast little robotic pup is eager to play fetch, knock a soccer ball around, and chase kids around furniture. While it doesn’t really live up to the expectations set by the commercial, it still fascinates most kids. Its robot face is more expressive than expected since it only uses lights and no movements, and it’s bark is loveable. Both of the problems users sometimes encountered have been fixed. The first, was Android users had difficulty using the app, but WowWee fixed all that noise. Secondly, the voice recognition is admittedly not all that great, but is easy to re-record the user’s voice so commands are received smoothly. These two fixes in place, CHiP is a nice gift for kids wanting a dog to play with without needing to scoop the poops. 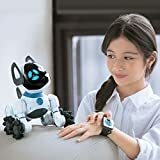 Include CHiP the robot dog, SmartBand, SmartBall, SmartBed, 4 wheel guards, power adapter, USB charge cable, Quick Start Guide, and Instruction Manual. Be sure to check out CHiP's website, and scroll down to the bottom for the helpful How To Videos. 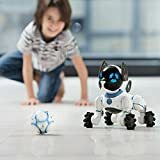 WowWee recommends CHiP as being for kids 8 and older, but we’ve found a number of 6 and 7 year olds really enjoy playing with him. It really just depends on how well the kid can learn the commands how patient they are about this learning process. So what does CHiP do? CHiP responds to commands sent from the SmartBand or app. When told, he’ll fetch his SmartBall, play soccer (run at the ball with force to knock it towards you), bark, ask for treats, do yoga, or play chase. Voice commands can be changed from the initial “Hey, CHiP” if it appears that the toy is having difficulty recognizing the user’s voice. When his battery is running low, CHiP will seek out his SmartBed where he can recharge for a bit before getting back to play. A power adapter is included, and can be plugged directly into CHiP’s belly when use of the bed is not desired, such as when travelling. NOTE: Updates have been made so that the app is fully functional with Android phones. There was some initial trouble, but WowWee saw to it all. For a much more comprehensive explanation into CHiP’s abilities, check out his manual. CHiP is ready to go almost straight out of the box. He may a brief charging period, but this can happen while the app is being downloaded. The app is compatible on iPhones, Tablets, iPads, and Androids with the KitKat software and above. Before purchasing CHiP, go to the app store and try to download the app. Download will not be possible if the device is not compatible. Be sure to do any needed software updates for the device before downloading the app, just to make sure things to go a bit smoother. The device may need to be rebooted after download, so it might be nice to do all this before giving CHiP to a child. To pair the SmartBand and SmartBall to CHiP, simply hold those two items near his back for a few seconds. This will allow the devices to connect with CHiP. The SmartBand can be used to give commands, used as remote control, and give CHiP rewards and praises for his behaviors. When CHiP’s eyes turn purple, it’s time for a recharge. 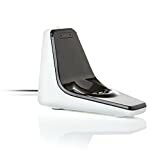 He can be told to hook himself up to his bed by holding down the thumbs up button on the SmartBand, or you can plug the charger cord into his belly. Either way, charging doesn’t usually take very long, playtime over an hour may need a charge or two to continue. The bed has a bright light on it that can easily disrupt sleep, so children who really want CHiP to stay in their room at night may need him to charge via the cord. Just leave the bed in another room where he can easily find it during daytime play. In order for CHiP to find his bed and ball, he’ll usually need a clear line of sight, so objects can’t be blocking the signal. Same goes for the SmartBand. If the band is hidden from CHiP around a corner, the dog may not receive the commands. CHiP plays a few games, such as soccer and chase. 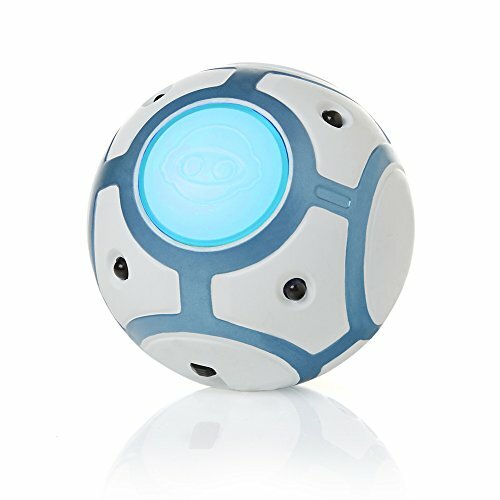 Soccer happens with him rushing the SmartBall in order to push it towards the user. This is hands down the favorite game for most children. Though built to withstand some abuse, don’t throw or try to bounce the ball. Occasionally rolling off a table shouldn’t break it, but it’s made of hard plastic and mechanical parts, not rubber. Rolling and gently tossing while on carpet are best. CHiP will also chase the user when prompted, but beware, as CHiP is surprisingly fast. We watched a six-year old really having to book it around the table in order to keep the robot from catching her heels. Because of the speed with which CHiP moves, it can hurt a bit if he slams into feet or ankles. Not enough to freak kids out, but enough that repeat offenses won’t feel so good. CHiP can be given commands by the SmartBand, the app, and by using the voice recognition. 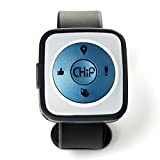 Initially, CHiP needs to hear “Hey, CHiP” quickly followed by a command in order to respond, but many users had trouble getting him to properly recognize a child’s voice. This can easily be fixed by using the app to re-record a new set of magic words. Just be sure that children know they have to say exactly what they record in order for CHiP to get the message. CHiP can also be renamed. We found that shorter names are easier, because saying “Captain Waggly Bottom” exactly the same way every time is challenging, even for adults. Aside from soccer and chase, CHiP can fetch his ball, “dance,” and do “yoga.” You can find out for yourself what all that means. He will also respond to such phrases as “sic ‘em,” which will make him bark and quickly move toward a person other than the one wearing the SmartBand. While the commercials show CHiP being able to detect when he’s about to fall off a surface, such as a table or stairs, we did not find this to be the case. Perhaps our pup is a bit near-sighted, but we had to make sure CHiP was not sent sailing over an edge. Tough as this little pup is, he’s not meant to take flying leaps of faith. Specially made wheels let CHiP move in all directions and with great ease. He works best on flat surfaces and low-pile carpet. Can he navigate pavement? Sure, but over time this could wear down his wheels faster than need be, as well as grind dirt into them which will scuff floors once brought back inside. CHiP is really an indoor dog. It seems the CHiP appeals more to younger kids, around 12 and under. Playing soccer and fetch is fascinating for little kids, but teens? Not so much. Check out our Cleaning Guide for Toys to see how to clean toys like CHiP, and a lot else. In-store CHiPs are white with black markings, but Amazon has a special Chocolate CHiP, which is a soft brown color. To help CHiP recognize voices easier, try re-recording the voice activation command in the app. This helps, so, so much.